It’s a pumpkin party! October is pumpkin season and even though I haven’t been to the pumpkin patch, I’ve been pumpkin-ing it up like crazy. I know there’s a bit of pumpkin backlash, what with the obsessions with pumpkin spice lattes and all, but it’s okay with me, even if it’s incredibly basic to be into pumpkin. I love the way it tastes: earthy, and comforting, and so full of fall. Pumpkin is best roasted – the sweetness really starts to shine and the pumpkin flesh becomes soft and yielding, almost a little bit like custard, but with a bit more body. 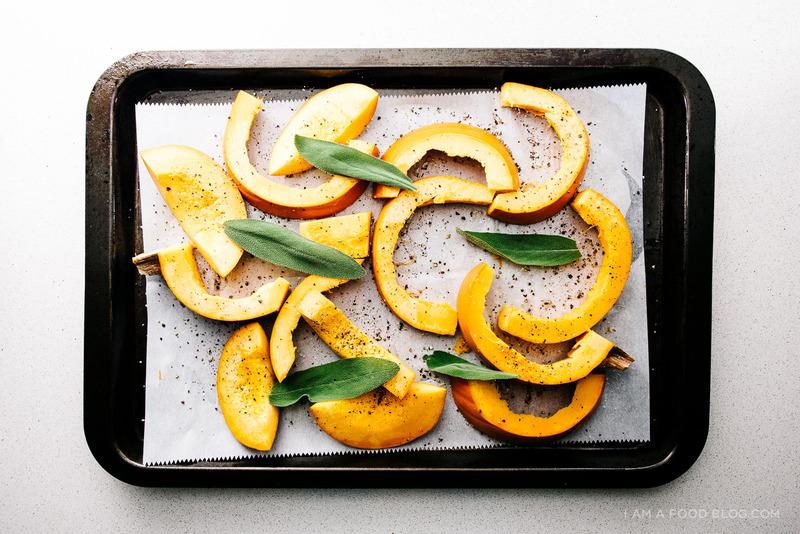 Roast pumpkin is delicious on its own, but when you cook it with a little bit of sage, it’s over the top addictive. I have to admit, I had a little bit of a nudge to make this recipe – Sarah, over at Cake Over Steak is hosting a #virtualpumpkinparty, so I decided to get into the spirit with a little cheesy pork and pumpkin stuffed shell action. 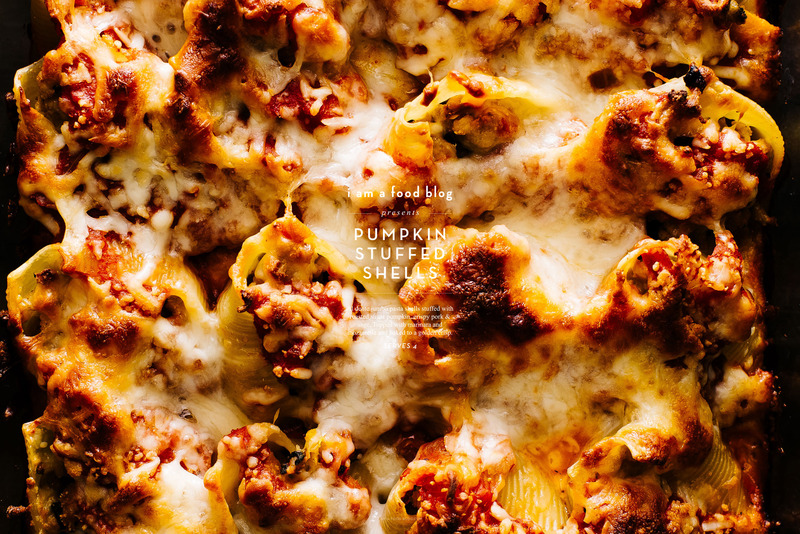 Cubed roasted pumpkin is mixed in with crispy browned pork and sage then stuffed into al dente pasta shells. The shells nestle into a simple marinara blanket before cozying up with some marinara and extra cheese on top. 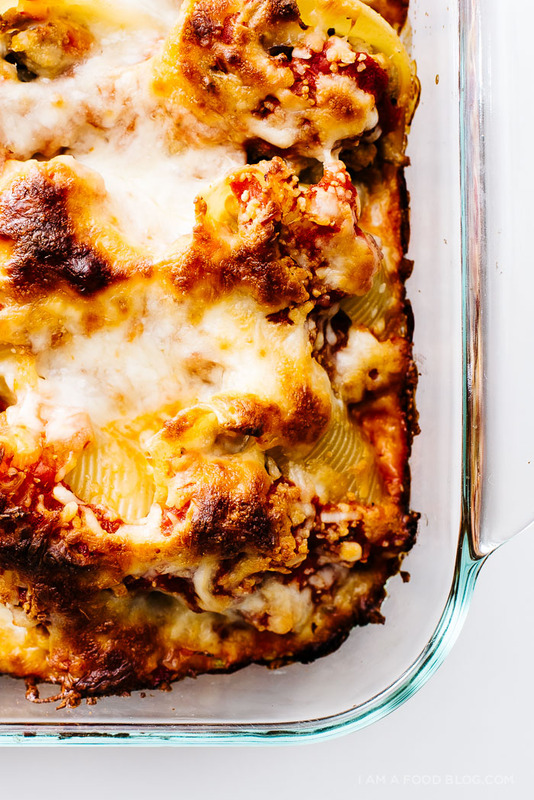 These guys are cheesy, hearty, and full of fall flavors. 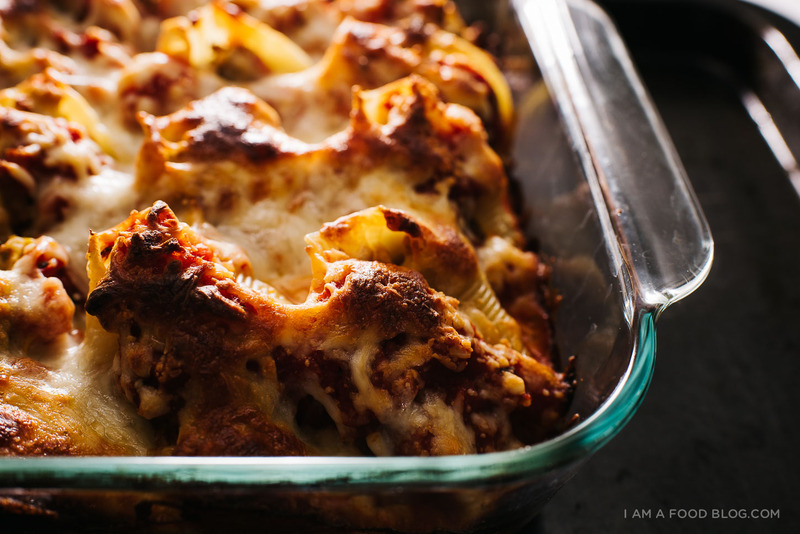 Stuffed shells are so addictive, both to eat and make. Hope you guys are getting your pumpkin on! If you need some inspiration, be sure to check out the party, over at Sarah’s! See you there! Peel and cube the pumpkin (In the photos, I sliced, but cubing will cook faster and eliminate the need for you to cube later). Place on a baking sheet (I lined my baking sheet for easy clean up) and toss with 1 tablespoon of oil. Season generously with salt and pepper. Nestle 5-6 fresh sage leaves into the pumpkin. Bake for 20-25 minutes until slightly golden and very tender. In a frying pan, heat up a touch of oil over medium high heat. Add the onion and cook, until slightly soft. Add the pork, and cook, breaking up, until golden brown and cooked through. Stir in the sage and red pepper flakes. Taste and season with salt and pepper. Remove from the heat and place in a bowl. By now your pumpkin should be nice and tender. Remove from the oven and stir into the pork mixture. Let everything cool slightly so that you can touch it comfortably. Be sure to leave the oven on as you’re going to bake the casserole. While the pork-pumpkin mix is cooling, cook the shells according to the package and drain. Typically I never rinse pasta, but in this case, we want to be able to touch the shells, so rinse off in cool pasta. Mix 1/2 cup shredded mozzarella into the pumpkin mix and give it another taste and adjust seasoning accordingly, if needed. Spread out 1 cup of marinara sauce in a square (8 or 9 inch) oven-proof casserole dish and set aside. 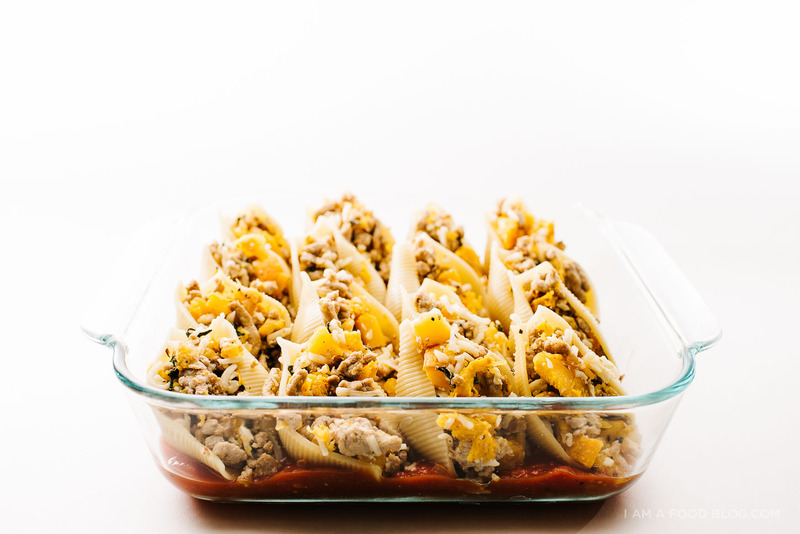 Stuff each shell with a generous amount of filling, placing the stuffed shells in the sauced dish. Stuff all the shells – you may have leftover filling, which tastes great on it’s own, or you can lay it on top of the shells. Top the shells with the remaining 1 cup of sauce and remaining 1/2 cup shredded mozzarella. Bake the dish for 30 minutes or until sauce is bubbly and cheese is golden. Remove and let cool slight before enjoying! Can I just add my vote of how amazing pork and pumpkin actually are together? Also, this is basically the definition of cozy. Bookmarked! This looks incredible! I completely agree regarding sage and pumpkin…the best combination! This pumpkin party is so great, I am so thrilled Sara put this together. With all my recipe testing I was feeling a bit over-pumpkined, but now seeing what everyone else created I am back in the mood! Oh my lord this is HEAVEN. Steph, you’ve done it again — I could eat this entire tray right now. So, so so amazing!! This looks insanely delicious! Happy pumpkin party day! Can I pretty please have this for breakfast? Please?! Looks amazing, Steph!! YAAYYYY thanks so much for joining in! This dish sounds ridonkulously good. My mother always used to make stuffed shells when I was a child, so they always conjures a sense of nostalgia for me. Loving the pairing of pumpkin and pork here for the filling. I am definitely making these. Happy Pumpkin Day! Yay I have a pork & pumpkin recipe for #virtualpumpkinparty too! These look insane, must make soon! These are so gorgeous, Steph! I love that prep shot, of the shells all lined up. Not sure if it’s just majorly appeasing my perfectionist brain or reminded me of a gorgeous underwater still life, but I love it, regardless. These sound amazing! This whole party has totally gotten me in the spirit. I’ve been slow to embrace pumpkin this year, but now I’m ready. This is a whole lot of cheesy goodness and I can’t wait to dig it! I can’t stop thinking about how perfectly stuffed and organized those shells are!!! You are the queen of stuffed shells!! Also, how much would you judge me if I ate all of these by myself? This looks incredible! Is this something that could be made entirely, or partially, ahead of time? I want to make this the night before I have a Friendsgiving so I can pop it in the oven the day of. Would it become soggy? you could totally make the entire thing ahead of time and bake it off as needed. it won’t become soggy as long as you cook the shells al dente according to the package. hope that helps! 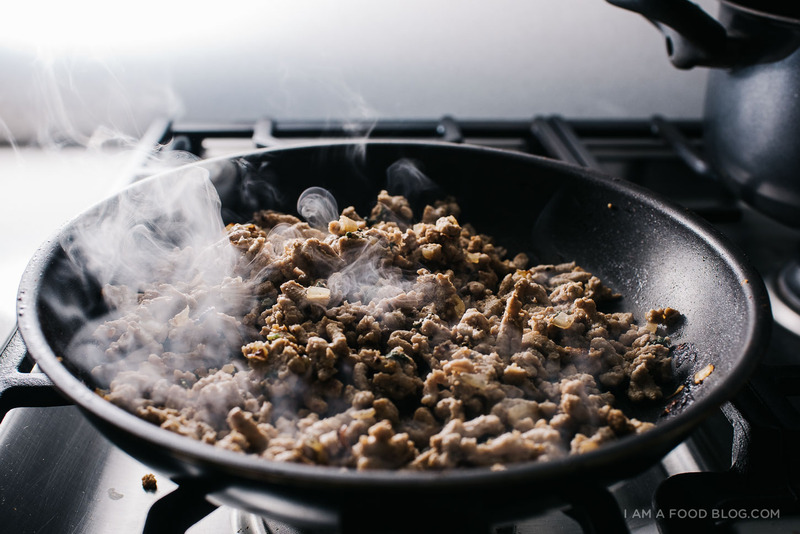 I’m so going to swap out the pork with either oyster or Chanterelle mushrooms. I think the flavors would pair perfectly for a veg version! Sage, cheese, marinara – all of this sounds like perfection! I love the idea of the pork, pumpkin, sage combo! 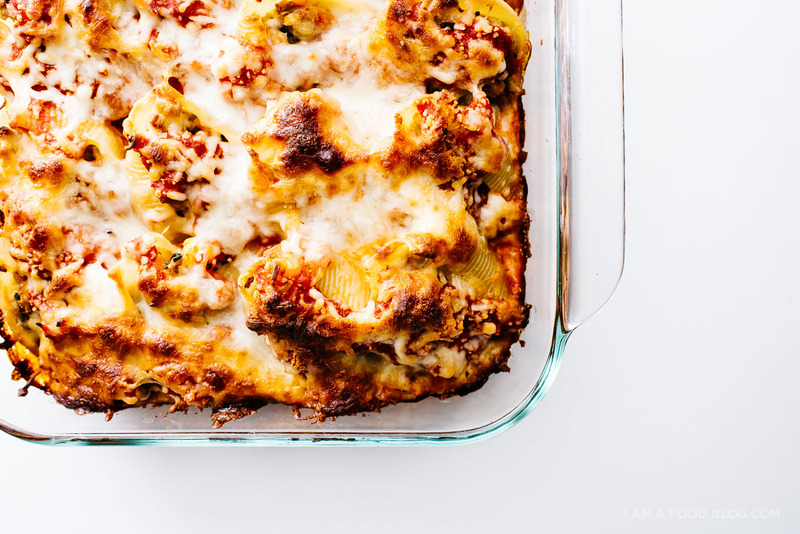 Also, cheesy stuffed shells always win. Hi, a very tasty recipe. I liked the pork, cheese and squash mixture. My friends exited my house very happy. Thank you and greetings from Spain. 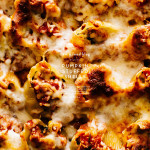 I just wanted to post and tell you how fantastic I found this recipe. I had to sub ground beef for ground pork due to grocery store selection, but i found the pumpkin addition to be amazing. Now I find myself wanting to roast and eat pumpkin with everything. Thanks for the great recipes, pictures, and stories! Won’t lie. Pretty in love with this. Bravo. Made this today and just ate it. So amazing. So so so amazing. Thank you! What a beautiful blog! This dish looks so amazingly yummy!😍 Love how you incorporated the pumpkin. So creative! i haven’t tried with canned pumpkin, but i think it would work! i’d use about 1/2 cup to start (mixing into the meat mixture) and if it doesn’t look like enough, i’d add an additional 1/2 cup. hope that helps!